Well, hello there. Remember me? I used to blog sometimes. It's been a very, very long time, so I will understand if there are no readers left, but I offer my eternal gratitude to anyone who is reading this. I recently finished my masters degree and find myself with a sudden surplus of free time, so it seemed like a good time to revive this old blog. The chocolate bar up for review today is neither flashy nor innovative, but it was so delicious that it has stuck with me for months. I received it as a gift from a coworker who had just come back from visiting her family in the United Kingdom. 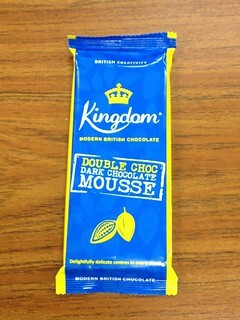 The Kingdom Chocolate Double Choc Dark Chocolate Mousse bar promised "Delightfully delicate centres in every chunk" and it delivered. For reference, the company's website describes this bar as "A rich dark chocolate bar with a dark chocolate ganache centre" and a minimum of 61% cocoa solids. As you can see, the chocolate was a rich, warm brown, and it had a satisfying snap (leaving lots of pretty fracture markings to admire). 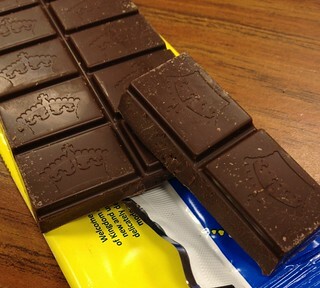 The filling was well-contained within the thick walls of chocolate, and the bar had a bitter and fudgey scent. Everything about this bar was satisfying. The thick chocolate was a pleasure to bite into, and the cool, creamy ganache center made each chunk like a little truffle. Once the chocolate started to warm up, the outer layer melted to become every bit as silky and smooth as the ganache. The cocoa flavor was on the mild side of bitter and just a little fruity - I could have done with a bit more bitterness. Kingdom does offer other bars that are more off the wall (like Milk Chocolate Rhubarb & Vanilla Centre), but I think the Mousse bar should please fans of milk and dark chocolate alike.